In July we had a look at the worldwide state of the Internet. Now the time has come for something a bit more specific, the state of the Internet in Europe. We’ll look at this from two angles. First, which countries in Europe have the most Internet users, and second, which countries have the highest Internet penetration. Both are relevant in their own right. Since Europe is such a diverse market with a multitude of countries and different languages, it makes sense to look at these countries separately. This contrary to the trend where people sometimes try to think of the European Union (much of, but not all of, Europe) as some kind of equivalent of the United States. The language issue alone makes the comparison moot. There are 475 million Internet users in Europe (worldwide total is 1.97 billion). Europe has 24.2% of the world’s Internet users. Europe as a whole has almost twice as many Internet users as the United States. The country with the most Internet users in Europe is Germany, with 65 million. The country with the fewest number of Internet users in Europe is the Vatican City State, with a whopping 93 Internet users (and a total population of 829). 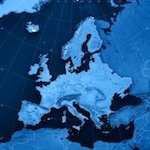 Ten European countries have more than 10 million Internet users. The average Internet penetration across Europe is 58.4%. By Internet penetration, we mean the share of the population with Internet access. We’ve already told you that Germany has the most Internet users in Europe, but what about the rest? 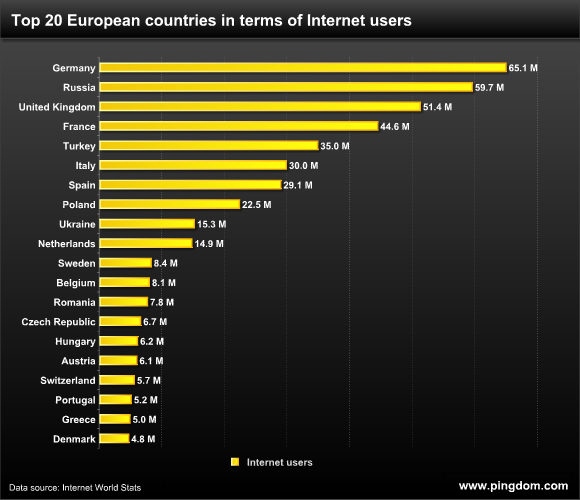 Here are the top 20 countries in Europe in terms of Internet users. It might be worth pointing out that both Russia and Turkey are only partially in Europe (for example, Russia spans most of Eurasia). Although Europe as a whole has almost twice as many Internet users as the United States, Europe is a much more splintered market, with different countries and languages. Hopefully this small study has given you a bit more insight into how the different European countries compare. It can be useful to be aware of the numbers in this article when considering for example localization of a website, or when selecting which markets to target. Data source: Internet World Stats. I would be interested in seeing what the average cost is for internet per country. This is a difficult question to answer, I know. It is not clear to me where “Internet World Stats” take their data from. And, most importantly, what is an “Internet user”? Thank you pingdom for these interesting data. The penetration results are just crazy : France is only 17th, Italy & Spain out of the top 20! Russia was never really part of Europe in the history. Neither was Turkey and other countries. Most people don’t see Russian or Turks as Europeans as they don’t behave as such either. If they don’t integrate themselves they cannot consider to be Europeans no matter what dumb politics say, in Europe politicians do exactly the opposite as what people think on the streets. Thats specially truth for Spain, Germany, Finland and Norway and of course France. Russia has always been in-between Europe and Asia, and even though we Russians have European looks (well, frankly I’m not that sure anymore, seeing the French news reports :), but culturally we’ve always been stuck between European rationalism and Asian traditionalism. This made us equally alien both in Europe and Asia, or, perhaps, equally close to either. From the Geographic point of view, strictly scientific that is, most of Russian population lives in Europe, which spans east up to Ural mountains in Siberia.